Today I’ve decided to post the TBR I have on my Kindle. I was given my Kindle as a present well over a year ago for passing my GCSEs. But because I have a bookshop problem (in the sense that it’s rare for me to go into a bookshop and not walk out with something) I haven’t had the interest to read on my kindle when I have all these books staring at me. So I’ve decided in November, I’m going to read only books on my Kindle! 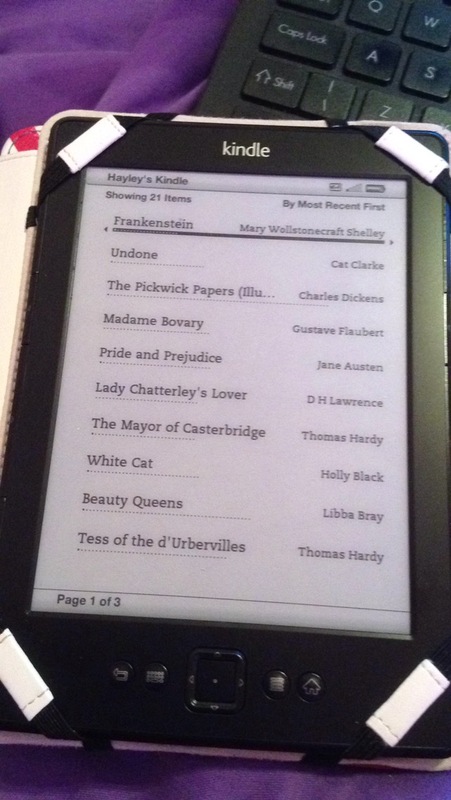 I try to keep a limit on unread books on my kindle, to have as many as the front page shows. Tess of the d’Urbervilles – Thomas Hardy. I’m highly intrigued by Frankenstein as Halloween is approaching! The BBC produce miniseries of classic novels so I hope I get to this one before it airs, which probably won’t be until 2015 but ya know, early bird catches the worm and all that. Previous Previous post: Ahhhhh the stress of daily blogging. Next Next post: Anticipated Film Releases: October-December 2014.